I haven’t read a book like this for a long time and it was a nice change. 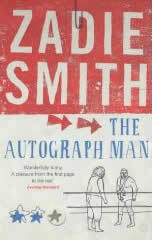 Reading Zadie Smith is like a breathe of fresh air with her colloquial and modern style of writing. The dialogue between the characters is believable, even if most of the storyline is a far fetched. Alex-Li Tandem is an Autograph Man who buys, sells and fakes autographs. He has an unhealthy obsession with a movie star, Kitty Alexander. He is a lazy, self destructive twenty-something, living in a messy apartment, spending his days drinking and smoking too much while watching old films. After waking up one morning with a horrific hangover and no memory of the last couple of days, Alex-Li finds a very special autograph, one that he has been waiting years to receive. But why has it been sent now? And is it really authentic? He travels all the way to New York to find out. However, the book is about more than autographs and celebrities. I found that the strongest theme throughout is of friendship. The book opens with four misfit Jewish kids on the way to a wrestling match and similarly ends with them assembled together as fully grown, misfit men. Alex-Li is still recovering from his father’s death 15 years earlier, and helping him through are; Adam, the overly religious, pot smoking best friend, Rubinfine, the annoying Rabbi, constantly sharing his own religious analogies with anyone and everyone, and finally, Joseph, who first introduced Alex-Li to the exciting world of autographs. These friends are always ready to help Alex-Li out, through every drunken mistake and hangover. I did enjoy the book, but I found it hard to sympathise with any of the characters. None of them are particularly likeable and by the time I had finished, I still didn’t ‘feel’ anything towards any of them. What kept me reading, was the fresh style of writing. It is funny and quirky, but also full of sorrow. What ruins the book for me, is some of the completely ridiculous and unbelievable storylines. I think it would have been better to stick to the odd characters in their everyday lives, with the celebrities being out of reach. The book has such a promising start but after Alex-Li leaves New York, I lost interest. Having said that, I definitely won’t give up on Zadie Smith, and her unique books. I did not think much of her first novel, White Teeth, when I read it a few years ago but I won’t be put off and will certainly give On Beauty, her most recent book, a go. I think we have more to expect from Zadie Smith, and I’m sure one day, she will write a truly wonderful book. See what you think, buy the book by clicking on the picture below.